Anyone else sad to see the TV seasons ending? I’m going to have to start getting creative if I hope to find TV to fill the empty hours left by the lack of prime time. I especially enjoyed Fringe and Dollhouse this season…I hope hope hope they come back! I also loved watching the craziness of Coach on Survivor. What a kook. Very entertaining. I think we’ve still got some finales to go, right? Private Practice? Brothers and Sisters? We’ll see what they come up with. I’m happy that the cable networks offset their seasons…In Plain Sight is back, and I love it. Looking forward to The Closer next month. And of course, SYTYCD starts soon!!! Woo hoo!!! I’ve been getting more comments from people who have downloaded my hex templates. (Thanks, Ida and Susan!) I hope they’re helpful! I love to hear that people found just what they were searching for at my little home on the web :) I need to add something new to the free download page, don’t I? Maybe an embroidery pattern…I’ll work on it. I got a little sewing done last weekend. 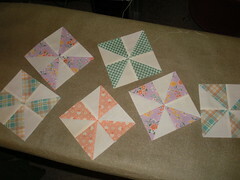 I finished up my contribution of pinwheels that will make the border around our little dresses quilt. I forgot to take a picture of my second little dress, my friend Pauline posted this photo on facebook, and I “borrowed” it. Thanks, Pauline! My blocks are the plaid dress (2nd row, 3rd dress) and the lavender dress (3rd row, 4th dress). And here are my pinwheels…everyone is making six using scraps from our dresses. I won’t lie…I did not find making pinwheels very fun. 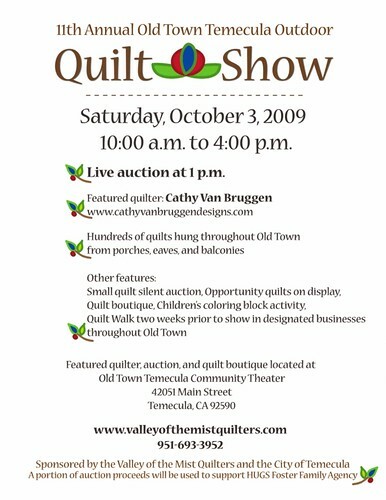 My centers are really bumpy…Lynn, our fab group member and long-armer will probably be cursing me when she goes to quilt these. 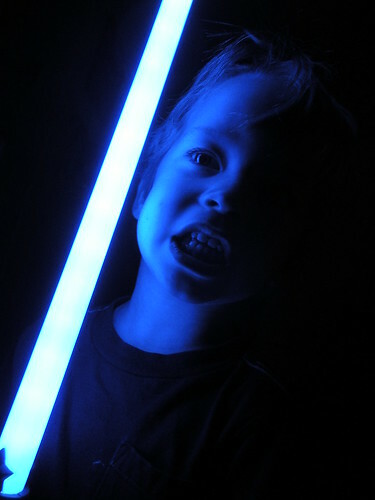 In other news, William got a light saber…that was fun for five minutes. And we redid the train table yesterday…almost two hours of assembling and reassembling what must be yards of track pieces and buildings. But he’s playing quietly in there now, so it was well worth all the trouble. Have a great week, everyone! 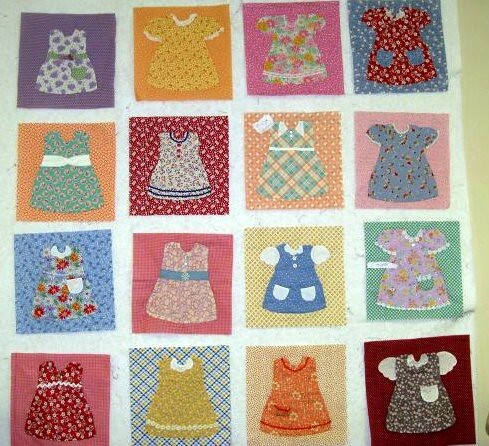 The pattern we used is called Darci’s Dress Up by Quilted Quickies – I’d love to see a picture of your quilt!